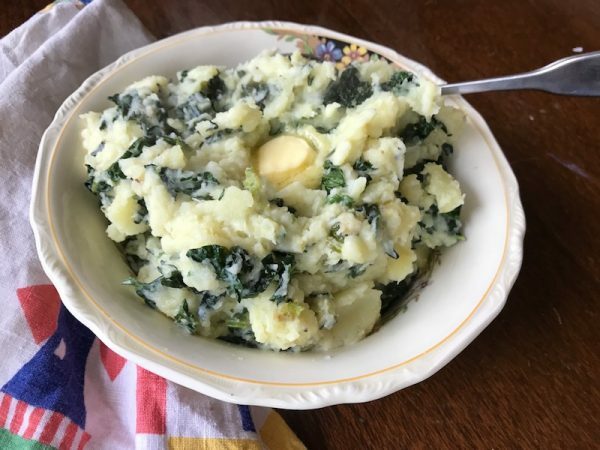 This is a fantastic way to kick up your regular mashed potatoes – sometimes even a meal in itself! Peel and halve the potatoes, add them to a large pot, and just cover with cold salted water. Bring to a boil over high heat and then simmer until cooked, about 20 minutes. Meanwhile in a frying pan over medium heat, saute the kale/silverbeet in a little organic olive oil or butter until wilted. Turn off the heat and set aside. When the potatoes are cooked, drain them and mash with the organic milk, butter, salt, pepper, and cheese. You want them to be quite lumpy, so don't mash too hard. Feel free to add a little more milk if wanted, but keep it reasonably thick. Mix in the kale/silverbeet and taste for seasoning. Serve with a dollop of organic butter on top.